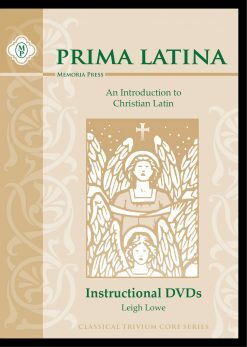 The Prima Latina Instructional DVDs feature detailed instruction by the program's author, Leigh Lowe. Lessons are approximately 20 minutes each. Sample available below. 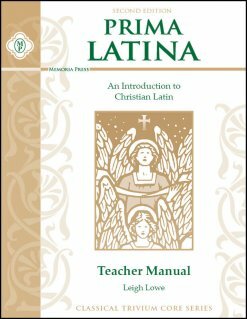 Prima Latina was written to transition directly into Latina Christiana, allowing students to complete an entire Latin sequence without missing important concepts or vocabulary. 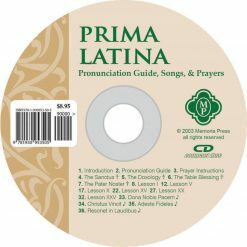 The Prima Latina Complete Set is accompanied by an audio CD which includes pronunciation direction for each lesson and four beautiful hymns from Lingua Angelica. 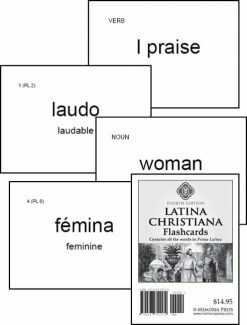 Because Latina Christiana Flashcards include every word in Prima Latina, they are an ideal study aid and a great investment for students who intend to continue on with Latina Christiana. The Prima Latina Complete Set includes the three items in the Basic Set (Student Book, Teacher Manual, & Pronunciation CD), Flashcards (which can be used the following year with Latina Christiana), and DVDs. Need Lesson Plans for Prima Latina? This is my first year homeschooling my 1st and 2nd grader and naturally Latin seemed daunting! I thought for sure my boys would hate this part of homeschooling but honestly it is one of there favorites… The video is very helpful for pronunciation and basically teaching what I would have no idea teaching. The CD reinforces pronunciation and we do it as review in the car. The workbook lessons go well with the video and again reinforces through writing what they’re learning. I haven’t used the Prima Latina copybook simply because I’m saving cursive for the summer but I plan on using it to keep the Latin they’ve learned throughout the year fresh in their minds. This is our first year doing Latin and we have really enjoyed doing Prima Latina. I say we because I have been learning it alongside my daughter! It has been very easy and straightforward to learn and the DVD and CD have been very helpful especially with pronunciation and reinforcing the rules. My only suggestion would be making the DVD and CD digital in the future so that they can be watched/listened to across devices. My 1st grader is doing very well with this program! I never realized before how many of the Latin verbs are in our everyday language. As I would like to teach my girls Spanish someday soon, I believe Latin will be a great stepping stone towards that as well. My daughter’s favorites are the Latin prayers and songs. This is a wonderful introduction to Latin for beginners! My children have grown to learn and love Latin through this curriculum. It is very straightforward and carefully put together with the intention of ingraining Latin into the minds of children. My kids love learning derivatives and playing games with the flashcards. We loved Prima Latin! It is very straight forward in its approach. The children picked it up easily, and were able to apply much of it to our other lessons quickly. I didn’t feel like we were “wasting time” with unnecessary fluff. 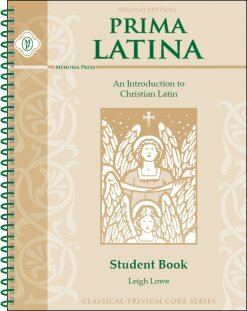 We started Latina Christiana a few months ago – and I was so pleased at the foundation Prima Latin gave all of my children (and me, having never experienced the joy of Latin, but always wanting to!) It has been a great experience for our family! My kids have really engaged with the Latin language since we started using Prima Latina. The Prima Latina program is easy for children to understand and is appropriate for a wide range of ages – very nice for homeschoolers! The DVD is very helpful while I’m driving: Even my preschooler has learned all the prayers just listening to and watching the videos. I would like Memoria Press to make some Latin story books or even some family-oriented games (there’s a reference to “Review games” in the Curriculum Manual, but no games included). My husband and I enjoy learning Latin with the program, and we’d like to read a story or play a game with the children – something that relates to a group of lessons or the program, in general. My only dissatisfaction concerns the flash cards: They were a little difficult to use out-of-the-box. There are a lot of flash cards (to include those for the second program, Latina Christiana), and they were not organized by lesson. I spent a few days, at the start of the program, organizing them by lesson. I punched a hole in the top, left corner and use a large ring to keep them in order – now they are much easier to both use and reference. 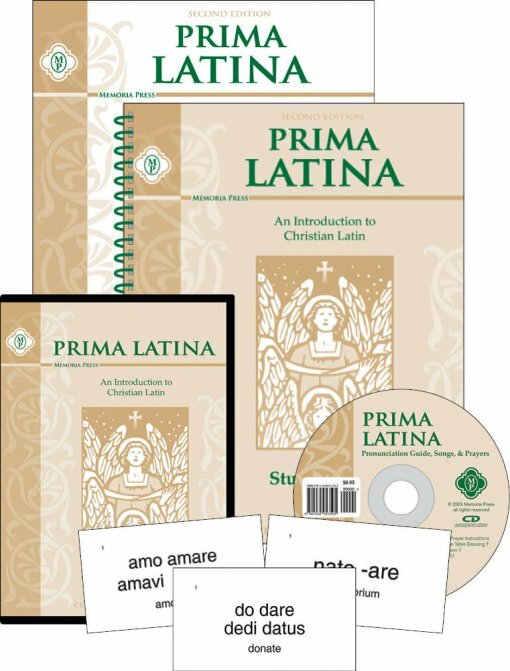 After researching all of the Latin programs on the market, I can definitively say that Memoria Press’ Prima Latina is the best Latin language program for beginners and homeschoolers! Prima Latina has been an excellent introduction to Latin for my 2nd and 3rd grader this year. 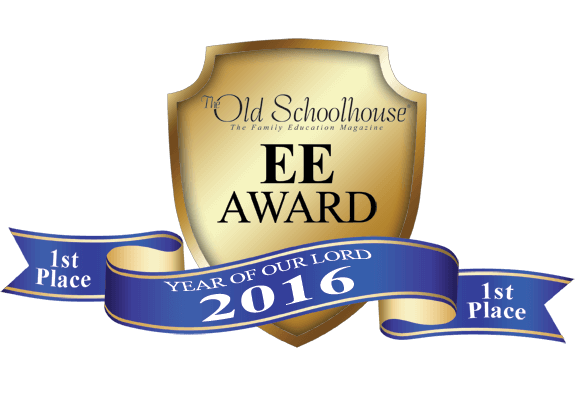 The lessons are clear and engaging without busywork. My children have enjoyed the dvd and the flash cards make review quick and easy in our daily morning time. I’m thrilled with their retention and the foundation we’ve laid before beginning Latina Christiana. I love the foundation Prima sets for students. Our family loves Prima Latina! It lays a great foundation for studying Latin. We enjoy watching the DVD and the workbook is very helpful in memorizing the material!